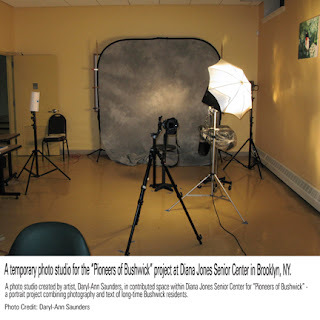 Through a proposal to the Brooklyn Arts Council's Space for Art* program last year, I was selected for a visiting artist residency at the Diana Jones Senior Center in Bushwick, Brooklyn. The Center director, Narcisa Ruiz-Secchiano, generously contributed space there for me to work on "Pioneers of Bushwick" - a photography and text project honoring residents living in Bushwick from 1975 or before. Here is a photo of the temporary studio setup - wonderful! So the project is up and running. If you are interested in participating or know any possible candidates (people OR businesses in Bushwick since 1975), I'd greatly appreciate hearing from you as soon as possible. E-mail me at das@PioneersOfBushwick.com. Thank you! *Space for Art is a collaborative project initiated by the Brooklyn Arts Council in partnership with NYC's Department for the Aging (DFTA), Department of Cultural Affairs (DCA), representative agencies from each of the five boroughs and the Mayor's office. The program gives working artists studio space in senior centers throughout New York City in exchange for artist projects and activities that enrich the lives of seniors and community members.